Driven and focused, social work has always been Wilson’s passion, and her record here shows it. Since transferring to AU as a junior, she’s made it a habit to be involved. 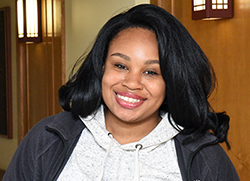 She is a resident assistant and treasurer of the Black Student Union, and during the summers she volunteered with YMCAs in Aurora and Chicago, Planned Parenthood and Cabrini Green Legal Aid, a Chicago nonprofit social justice organization. While Wilson is not the first AU graduate to join the Peace Corps, she is the first to be invited to join the organization since the university began offering the Peace Corps Prep Program (PCPP) last fall. According to Amir St. Clair, who directs the program, Peace Corps recruiters seek out volunteers like Wilson who not only have a “service-oriented heart” but also have similar resumes. Participation in the PCPP, he added, helps students who are considering entering the Peace Corps build the skills and experiences that recruiters seek. Offered at some 70 universities nationwide, the PCPP is a certificate program that combines courses designed to build an applicant’s cultural understanding, leadership abilities, language skills and expertise in areas such as education, health or the environment with hands-on field work and community service. AU offers the PCPP certificate as a complement to the leadership studies major, although students from all majors are encouraged to enroll. Interested students typically would become involved in the program as freshmen or sophomores, according to St. Clair. “Currently we have two students who are officially in the program and several others who are interested,” he said. For more information about the PCPP program or to apply, please contact St. Clair at (630) 844-7556 or astclair@aurora.edu.